Uglyworld #30 - Wedgehead's Surprise, originally uploaded by www.bazpics.com. When I arrived at Mireille's this evening I found Babo, Ox, Jeero, Icebat and Wedgehead watching TV. Wage and I had stopped in past one of the supermarkets near my house to pick up a surprise for Wedgehead, and by hell was he excited when he saw what we had for him. 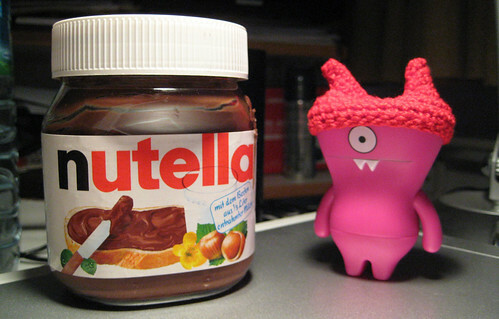 After regaining his powers of speech his first words were "It's the biggest tub of Nutella in the world, EVER!!!". I'm sure it won't take him too long to empty the tub, such is his love for the stuff.